Growing up in Chicago, I doubt that Officer Louis Ellison thought he would end up in Atlanta, but he attended college at Morris Brown and the seed of his future was set. After college he returned to Chicago and worked as an officer with the Chicago Police Department, but he just couldn’t stay away from us. Today Louis makes his home here in Zone Six and is working with the Atlanta Police Department bringing his total time in law enforcement to ten years. For the past month he has also been working for us as our newest member of the Virginia-Highland Security Patrol (aka Fight Back Against Crime – FBAC). 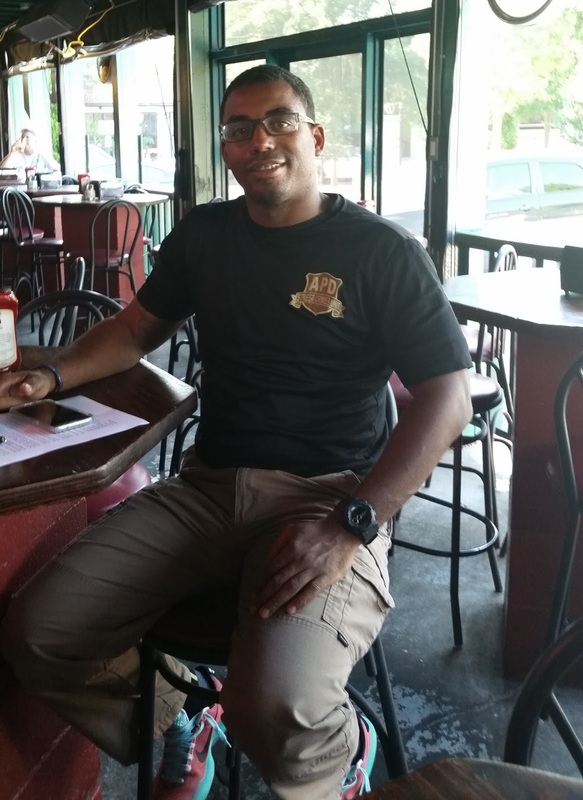 Officer Ellison enjoys being able to give back to the community and we love having him as a part of it. He told me that if he wasn’t a police officer, he would probably be involved in Real Estate, so here is a quiz for you. Who recognizes the location for this candid shot? If you see him around the neighborhood, in or out of uniform, please go up and say hello and thank you, and as he is quick to remind us, “If you see something strange or not right, call it in!”. Hey! Great to see that someone is reading these posts! Proud to call this officer my brother.